Hello and welcome to the 204th instalment of the SWD. The Syrian Democratic Forces foiled an ISIS attack on its positions in Al-Amin neighbourhood before they could move. 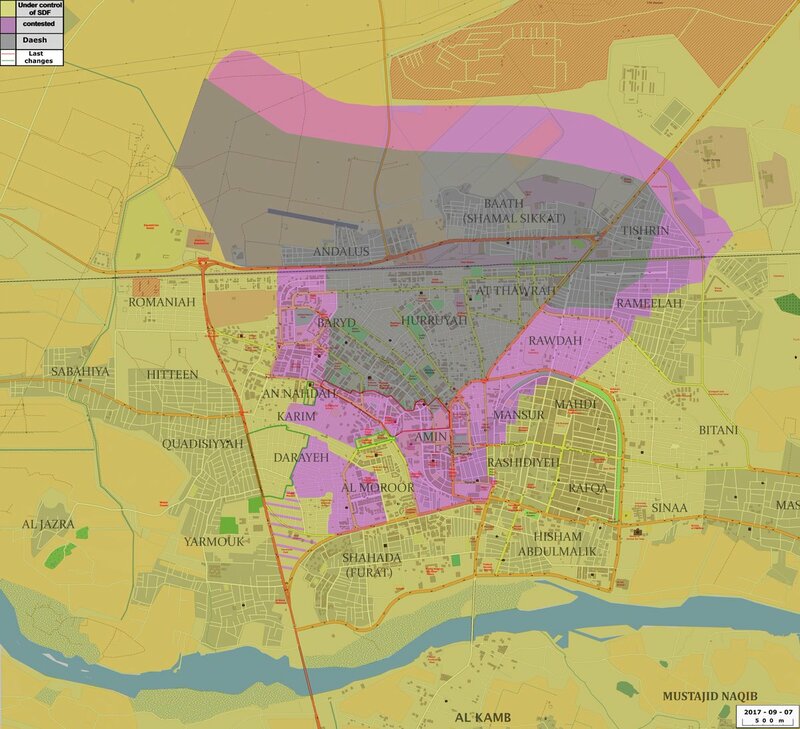 Then, the US-backed forces entered the centre of Raqqa city thanks to the preemptive attack momentum. On the other side, the Islamic State claimed to have killed, at least, 29 SDF fighters and wounding ten other. 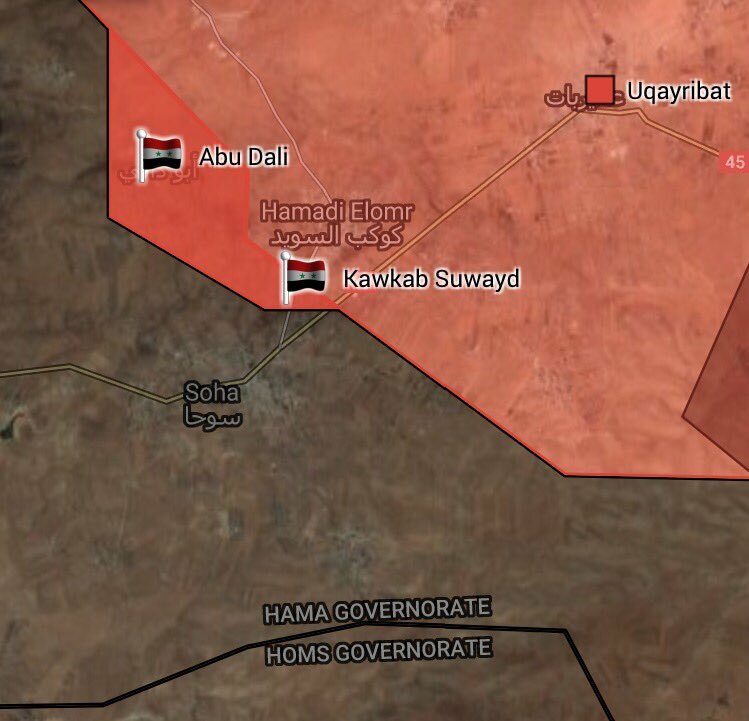 The Syrian Arab Army and its allies captured Kawkab and Abu Dali in East Hama countryside from the central Syria besieged ISIS forces. The Islamic State claimed to have killed nine SAA soldiers close to Juruh village and uploaded a video of a SVBIED video targeting government forces. By late night, the Israeli Airforce targeted one military base located west of Hama city, and east of Musayaf. The attack killed two people and injured three more people, according to Syrian state media. The strike intended to destroy suspected Syrian SSRC chemical weapon’s facility. The opposition group “Faylaq al-Rahman” released some footage of an ambush against SAA 4th division Republican Guard soldiers, which resulted in an unknown number of government soldiers killed. The Syrian Arab Army captured Raqqa bridge, which is north of 137th Brigade base and east of Tel Hjaif in Deir ez-Zor countryside. Additionally, government forces have extended the Deir ez-Zor corridor to more than 10 km as operations continued. 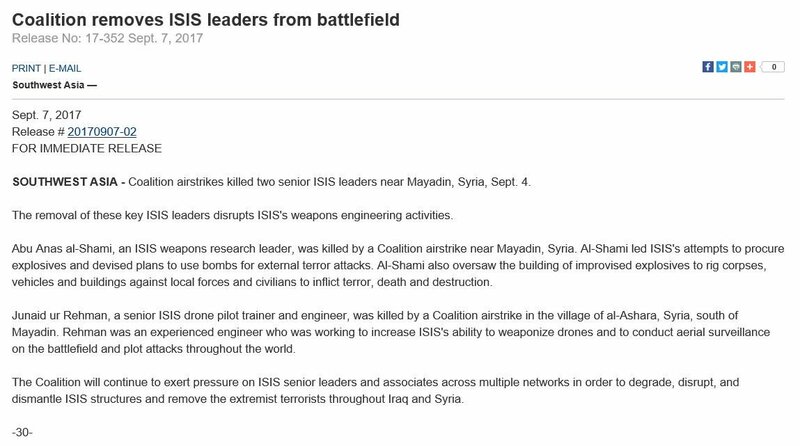 The US Coalition announced its airstrikes killed at least two senior ISIS leader: Abu Anas al-Shami and Junaid ur Rehman near Al-Mayadin past September 4th. On the 6th of September 2017, CJTF-OIR has conducted eight strikes in Syria. CJTF-OIR‘s main focus in Syria is Raqqa region where they did eight strikes supporting SDF‘s operations against IS destroying 13 fighting positions, damaged five fighting positions and suppressed two fighting positions. The full report on CJTF-OIR strikes conducted in both Syria & Iraq can be found here.